Renowned climate scientist Michael E. Mann will discuss his new book, The Hockey Stick and the Climate Wars, and speak with CICS-NC and NCEI scientists on Wednesday, April 4, at the CICS-NC Research Institute. He is also giving public talks at UNC Asheville and Warren Wilson College. Mann, a Penn State faculty member who holds joint positions in the departments of meteorology and geosciences, is director of the Penn State Earth System Science Center. He was a lead author on the Observed Climate Variability and Change chapter of the Intergovernmental Panel on Climate Change (IPCC) Third Scientific Assessment Report in 2001. He shared the Nobel Peace Prize with other IPCC authors in 2007. He is also co-founder and contributor to the award-winning science website RealClimate.org. Mann is best known for his work reconstructing climate fluctuations over the past one thousand years. Dubbed the hockey stick graph, the chart was prominently featured in the IPCC 2001 report on global climate and became a central icon in the controversy that followed the report’s publication, known to many as the “climate wars.” In his talk, Mann will share the story of the science and politics behind the controversy surrounding climate change. 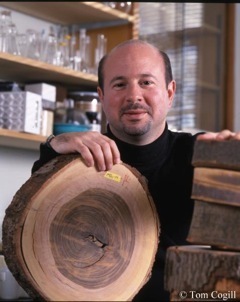 Mann has received a number of honors and awards, including NOAA’s outstanding publication award in 2002 and selection by Scientific American as one of the 50 leading visionaries in science and technology in 2002.